Combination units offer all the convenience of a hob and sink but in one single unit so theres no worktop wastage. Our range of combis from Smev, Can and Cramer are top quality units and you'll be sure to find one to fit your vehicle whether its a caravan, motorhome or campervan. 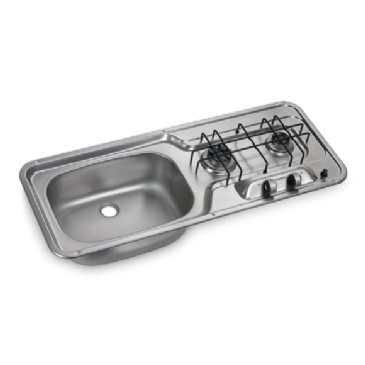 Rectangular gas hob-unit 1 burner with rectangular sink complete with tempered smoked glass lid, burners with self-blocking flame lid, s/s built-in support grid fixed with anti-vibration rubber-washers and disappearing hinge. 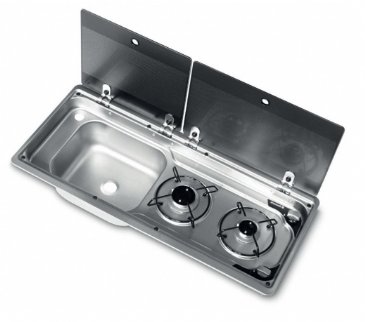 Rectangular gas hob-unit 2 burner with rectangular RIGHT sink complete with tempered smoked double glass lid, with burners with self-blocking flame lid, s/s built-in support grid fixed with anti-vibration rubber-washers and disappearing hinge. 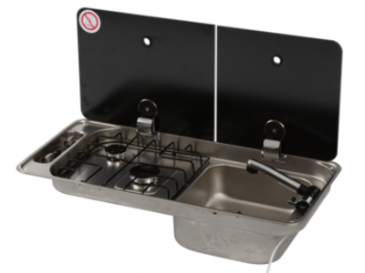 Rectangular gas hob-unit 2 burner with rectangular LEFT sink complete with tempered smoked double glass lid, with burners with self-blocking flame lid, s/s built-in support grid fixed with anti-vibration rubber-washers and disappearing hinge. 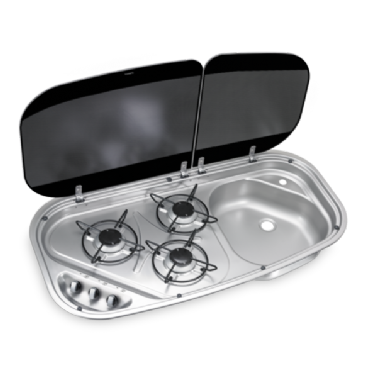 The compact Dometic HS 2320 L is a convenient two-burner gas hob and sink combination for motorhomes and caravans, with the sink positioned to the left of the gas burners. This cleverly designed unit fits neatly into the kitchen area without taking up lots of valuable space. 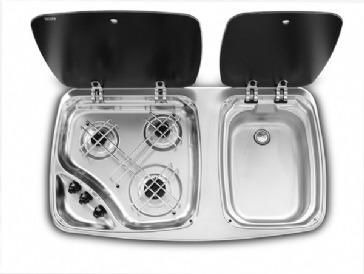 The compact Dometic HS 2420 R is a convenient two-burner gas hob and sink combination for motorhomes and caravans, with the sink positioned to the right of the gas burners. This cleverly designed unit fits neatly into the kitchen area without taking up lots of valuable space. 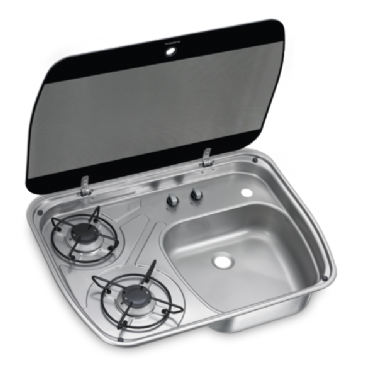 The compact Dometic HS 2460 L is a convenient two-burner gas hob and sink combination for motorhomes and caravans, with the sink positioned to the left of the gas burners. 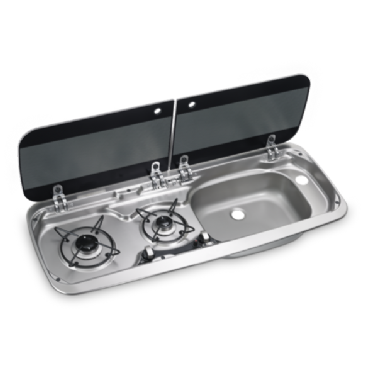 The compact Dometic HSG 2370 L is a convenient two-burner gas hob and sink combination for motorhomes and caravans, with the sink positioned to the left of the gas burners. 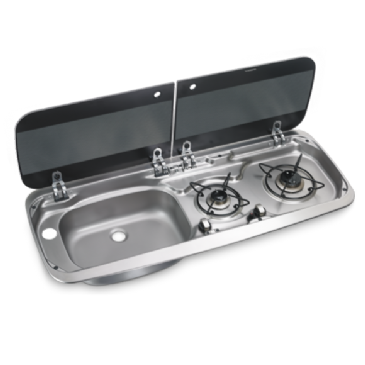 The compact Dometic HSG 2370 R is a convenient two-burner gas hob and sink combination for motorhomes and caravans, with the sink positioned to the right of the gas burners. 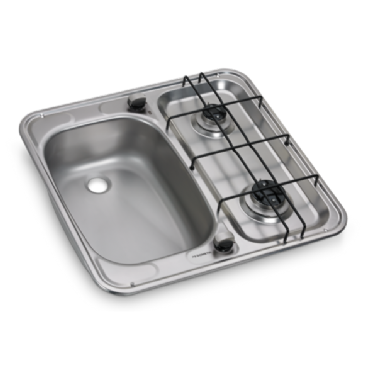 A compact two-burner hob and sink combination with glass lid bringing on-board kitchen facilities to even the smallest of spaces. 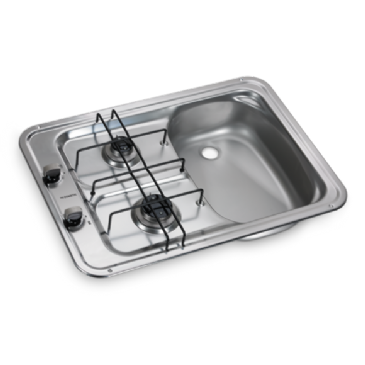 A compact three-burner hob and sink combination with glass lid bringing on-board kitchen facilities to even the smallest of spaces. 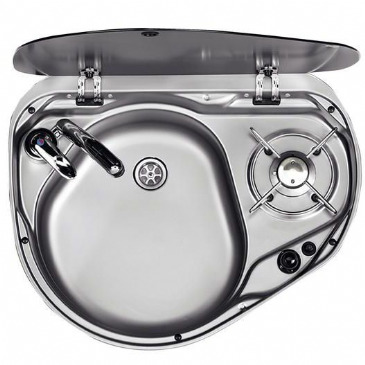 The Dometic 7123 hob and sink combination is a very modern, stylish stainless steel unit finished with two heat resistant Black glass lids. 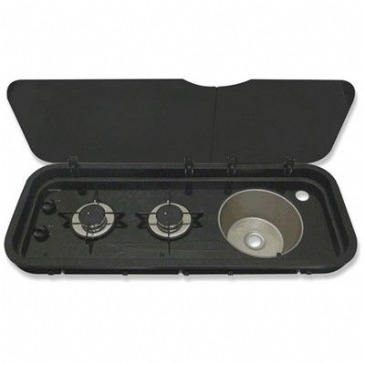 This three burner combination gives you plenty of room for cooking and washing up in your campervan, motorhome or boat. Stainless Steel. Intergrated heat resistant safety glass lids. Enamelled burner caps. Recessed Controls. Dimensions: 970mm width x 430mm depth x 145mm height. Electronic 12v Ignition. Safety Ignition System. Pre-Drilled Hole for Tap (not included). Complete with 20mm Waste Outlet. 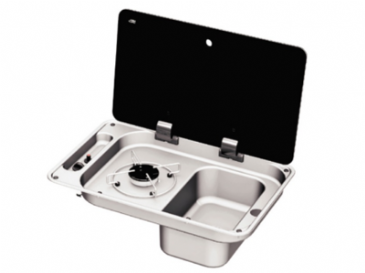 The Smev 8323 hob and sink combination is a modern, sleek design, fitting nicely into your campervan, caravan or motorhome. 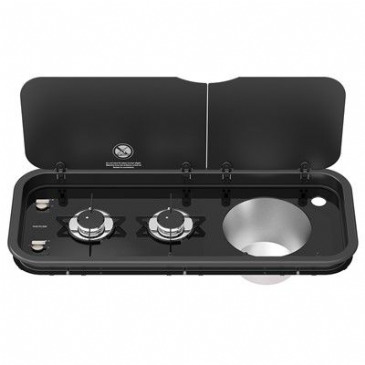 Constructed from robust stainless steel, finished with a heat resistant Black glass lid. Available in left or right hand sink. 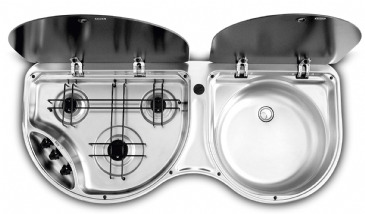 Underneath the break-proof glass lids this creative and functional SMEV combination unit accommodate a double-burner hob and a sink to match - all in the smallest possible space. 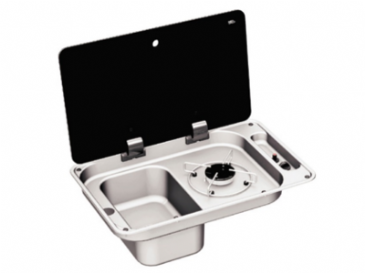 The new stylish, compact Smev 9722 sink and hob combination is the ideal solution for making the most of minimal space in your campervan, motorhome, caravan or boat. 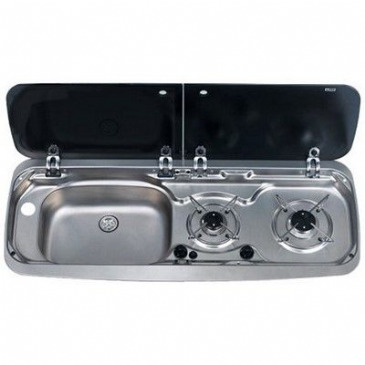 Underneath the break-proof glass lids this creative and functional SMEV combination unit accommodates a double-burner hob and a sink to match - all in the smallest possible space. Thetford Topline 111 Recessed rectangular double burner combination unit with 12V ignition, and black tempered glass lid. 900mm (W) x 195mm (H) x 370mm (D), 2 x 1.5KW burners. 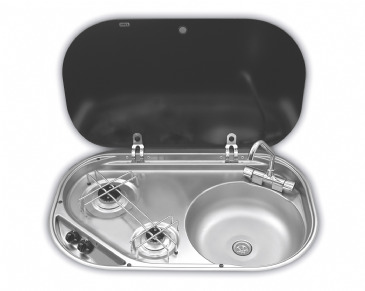 Unit is complete with anti-vibration rattle free built-in pan support and captive burners. 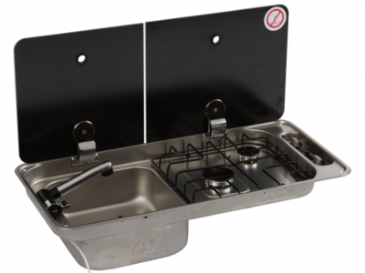 Thetford Topline 111 recessed 2 burner hob/sink combination in black glass. 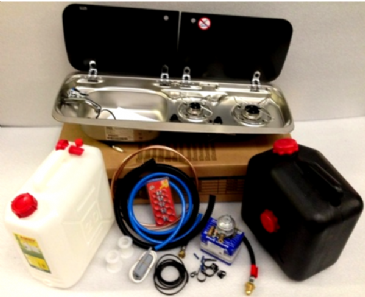 Includes 12V ignition, black glass lids, nickel burner knobs, anti-rattle pan supports and 2 x 1.5KW captive burners.